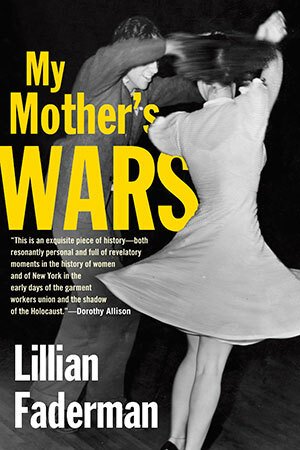 A story of love, war, and life as a Jewish immigrant in the squalid factories and lively dance halls of New York’s Garment District in the 1930s, My Mother’s Wars is the memoir Lillian Faderman’s mother was never able to write. The daughter delves into her mother’s past to tell the story of a Latvian girl who left her village for America with dreams of a life on the stage and encountered the realities of her new world: the battles she was forced to fight as a woman, an immigrant worker, and a Jew with family left behind in Hitler’s deadly path. The story begins in 1914: Mary, the girl who will become Lillian Faderman’s mother, just seventeen and swept up with vague ambitions to be a dancer, travels alone to America, where her half-sister in Brooklyn takes her in. She finds a job in the garment industry and a shop friend who teaches her the thrills of dance halls and the cheap amusements open to working-class girls. This dazzling life leaves Mary distracted and her half-sister and brother-in-law scandalized that she has become a “good-time gal.” They kick her out of their home, an event with consequences Mary will regret for the rest of her life. Eighteen years later, still barely scraping by as a garment worker and unmarried at thirty-five, Mary falls madly in love and has a torrid romance with a man who will never marry her, but who will father Lillian Faderman before he disappears from their lives. America is in the midst of the Depression, Hitler is coming to power in Europe, and New York’s garment workers are just beginning to unionize. Mary makes tentative steps to join, despite her lover’s angry opposition. As National Socialism engulfs Europe, Mary realizes she must find a way to get her family out of Latvia, and she spends frenetic months chasing vague promises and false rumors of hope. Pregnant again, after having submitted to two wrenching back-room abortions, and still unmarried, Mary faces both single motherhood and the devastating possibility of losing her entire Eastern European family. Drawing on family stories and documents, as well as her own tireless research, Lillian Faderman has reconstructed an engrossing and essential chapter in the history of women, of workers, of Jews, and of the Holocaust as immigrants experienced it from American shores. My mother kept no secrets from me about her strange and difficult life before I was born. For most of my growing-up years, she and I lived together in a single furnished room, “by a missus,” as such living arrangements used to be called. I think our symbiosis was probably much more powerful than the usual between mother and child because most of the time there was no one but the two of us, no other presence to distract or divert. The intensity of my focus on her was compounded, I imagine, because our daily life was played out in the space of no more than ninety square feet. In that tight proximity, she told me things because she had no one else to tell them to. I saw things because she had nowhere else to go and hide. I struggled to understand things because she was my constant care and study and love. But the older I got, the less I understood. In the glorious hope and brashness of my young womanhood I knew only that the choices she’d made, which had brought her, and me along with her, to that lonely, airless furnished room of my childhood, had been incomprehensibly foolish, and that her mistakes would never be mine. Thirty years after my mother’s death, my young-womanhood long gone, a sadness suddenly came upon me with the thought that though I’d known all her secrets, I hadn’t known her. I think that sadness was triggered because I’d been trying to relearn Yiddish, the language I usually spoke with her before I started going to school; and in a book I’d bought in order to practice reading in Yiddish, I came upon a lullaby by the writer Sholem Aleichem; it was one I remembered her singing when I was a child. Bay dayn vigl zitst dayn mameh, Zingt a lid un veynt. Vest amol farshteyn mistame Vos zi hot gemeynt. Near your cradle sits your mother, Singing a song and weeping. Perhaps someday you’ll understand What her tears meant. My mother--who was not yet my mother--was kicked out of the home of her half sister Sarah and her brother-in-law Sam several months after she came to America. She was seventeen, and she didn’t mind very much being kicked out because by then there was somewhere else she’d much rather be living. Of course she couldn’t know in 1914 that she would pay dearly, even to the day she died, for Sarah and Sam’s anger with her. And though I wouldn’t be born for many years yet, I would pay, too: I think it’s fair to say that I grew up in the shadow of my mother’s tragedy, which, as things happened, had been made inevitable by what she’d failed to do before she was thrown out. In her shtetl in Latvia, she’d seen them only once. That was when Sarah, already a grown woman, came to say goodbye to their father before she and Sam left for America. Mereleh, as my mother was called, was five years old then, and she hid behind der tateh’s legs because she felt bashful when the stranger, who looked like a rich gentile lady in a big feathered hat and long white gloves, called her shvesterl, little sister. She was scared too of the man they said was her brother-in-law, though he ignored her as though she were a piece of the scant furniture. He was stiff and thin like a clothespin, with a scraggly pointed beard that wriggled like the one on the goat that had followed her down the street, pulled her little babushka right off her head, and started to eat it. In the next years, whenever der tateh got a letter from his eldest daughter and her husband in America, Mereleh remembered about them only that Sam had frightened her and that Sarah had dragged her from behind der tateh’s legs and hugged her to her big bosom so hard that even after their carriage drove away Mereleh’s cheek bore the indentation of a knob-like coat button. Yet there she was, twelve years later, living with them in America, sleeping on a Murphy bed in their front room. It had happened because in Latvia, even before Mereleh got her first period, she’d been sent out to be an apprentice, first to a milliner and then to a dressmaker, and with loathing she’d believed the needle would be her whole life. Then one of the girls with whom she worked at the dressmaker’s told her about a sister who’d gone to New York and was already an actress on the Yiddish stage and getting paid good money for it. That was when Mereleh began to dream. Why not? She’d danced at the Purim festivals in Rezhitse for several years, and every single time, the other dancers stopped to watch her and applaud. Though no one had ever taught her dancing, she knew exactly how to make her movements copy the clarinet’s moan, the accordion’s chortle, what to do with her hands, shoulders, legs, hips. After she danced at one Purim festival, a bunch of boys came up to her to tell her she was as graceful as a swan. It was ecstasy for her when she was dancing, like she was in a magical trance. When the dressmaker for whom she worked sent her on an errand and she had to walk through the forest, she even danced there, all alone, humming her own tunes and bowing extravagantly to the tree throngs as though they’d applauded. Why shouldn’t she go to America and become a dancer on the stage? How she convinced der tateh to go along with her plan she could never remember, or at least that’s what she told me: she only knew that he begged his oldest daughter and her husband to help her; and that Sam kindly sent money for her passage and gave an affidavit saying that if the authorities would allow her into the country, as her male relative he would take responsibility for her. Young as she was, my mother realized it was no small thing for Sarah and Sam to bring her to America and give her a place to live and food to eat, and she tried to show she was grateful. Every evening after she ate supper with them at the little table in the kitchen, she carried all the dishes to the sink and washed and dried them and put everything away in the cupboard. On Sunday mornings she gathered up all the dirty sheets, towels, Sam’s shirts and pants, everyone’s nightclothes, and she brought them down to the basement where she scrubbed them in the big tub and then carried them up to the rooftop and hung them on clotheslines, and when they were dry she ironed everything that needed ironing. She swept and dusted and washed the kitchen floor, too. “No, sister, I really like to,” she insisted when Sarah tried to take the mop from her hands and said she didn’t have to do so much around the house. But in truth, she felt awkward with Sarah and Sam--not shy as she’d been when she was small and they came to say goodbye, but never at ease. It jolted her in the beginning when Sarah introduced her to the neighbors as “my sister,” because Sarah seemed so old, more like an aunt than a sister, and there’d been no chance for sisterly feelings to develop between them. With Sam she was the most uncomfortable. He barely glanced at her and hardly ever said more than good morning to her. She worried that he resented having had to give the affidavit swearing he would be responsible for her. She felt she must get a job right away and start paying him back for all the expense she’d been to him. She didn’t know yet how you went about becoming a dancer on the stage--she planned to find out as soon as she learned a little more English. But she did know how to sew very well because she’d been doing it since she was a child, and Sam told her that on the Lower East Side, where there were sewing factories, everyone spoke Yiddish so she didn’t have to wait to learn English to work there. She soon found a job in a shop on Delancey that made pinafores; and every Saturday evening she counted out five dollar bills from the nine dollars and twenty-five cents in her pay envelope and handed them to her brother-in-law. “Listen, Mereleh, we’re not starving, and we’re your family, so you don’t need to worry yourself so much about paying us back right away,” Sarah always said. “You’re a good girl, very serious and responsible,” Sam pronounced tersely each time, folding the bills neatly into his wallet. His wagging goatee reminded her still of the goat back in Preil, though it didn’t frighten her as much as it once had. She was seeing almost nothing of America but a Brooklyn apartment and the pinafore factory where she worked six days a week. Nobody ever came to visit but Sam’s rotund cousin Esther and her husband Marvin, who was partners with Sam in the harness-making business. Every Sunday afternoon the four of them played pinochle until nightfall, cubes of sugar held between their teeth, sipping hot tea which Sarah would keep serving from a kettle on the stove that always emitted a low, monotonous whistle. Esther offered to teach Mereleh how to play, and because Mereleh didn’t want to seem standoffish, she tried it a couple of times; but she couldn’t see the sense or pleasure in it. While they played at the kitchen table, she sat at the front-room window and looked out at the movement of people and the horse and buggies and the automobiles turning off Ocean Parkway onto Ditmas Avenue. She would have loved to be part of the action in the streets, but when she announced one Sunday before Esther and Marvin arrived that she was going out for a walk, Sam said, “All by yourself” and she knew by the expression on his face that he thought it wasn’t proper for a young girl to go out walking all by herself. It felt like her old life in Latvia had happened a hundred years ago, yet she was tied to this new country only by the thin thread of her half sister and brother-in-law. At night in the dark, her cheeks and pillow were often wet with tears, and she scoffed at her foolish dream that all she would have to do was set foot in America and she would become a famous dancer. She asked herself, If this is all there is in America--hard work and a Murphy bed I have to pull down from the living room wall every night and put back up again every morning--why did I leave my home, my tateh and mameh, my little brother Hirschel, everyone I loved, just to come here? For what? She missed them so much, her real family. She kept thinking of the last time she saw them all . . . her tateh, his face white as salt, holding both hands over her bent head and blessing her . . . her mameh wiping her eyes with a corner of her apron . . . her sisters and little brother lined up like stair steps . . . Buna Rivka, who was the next-oldest after her, had called out in her foghorn voice, “Don’t forget what you promised!” because Buna Rivka too had already been sent off to slave as a tailor’s apprentice for room and board and two rubles a month, though her chest was still as flat as a door. Hirschel--her little darling, like her own baby ever since he was born when she was seven years old--would not look up at her. Tears bled down his cheeks and made dark bird’s-egg splotches on his thin shirt. The cart driver, who’d come all the way from Dvinsk and had been waiting for his sole passenger for some time already, was impatient to leave. He stood beside his old horse, stroking its mane gruffly as the animal whinnied and flicked its tail back and forth at the buzzing flies. He had to take her to Vilna, where she would get a train that would bring her to Hamburg, where she would get a boat that would bring her to Southampton, where she would get a ship that would bring her to New York . . . She’d been impatient to leave, too, one minute--and the next minute she wished she could send the cart away without her, and she’d live here in her shtetl forever and not have to make the long, scary trip all by herself.